When you understand the age of archaeological remains in the Middle East, it is almost comical to visit “old” historic places in the United States. For example, half an hour down the road from where I live is My Old Kentucky Home in Bardstown, Kentucky. I visited the site last year with my family. As you walk through the old house, which is filled with pictures and artifacts from the 19th century, it is amazing to think of how that building has been standing for 200 years. And yet that statistic pales in comparison to another building I was able to walk through on my last trip to Israel. 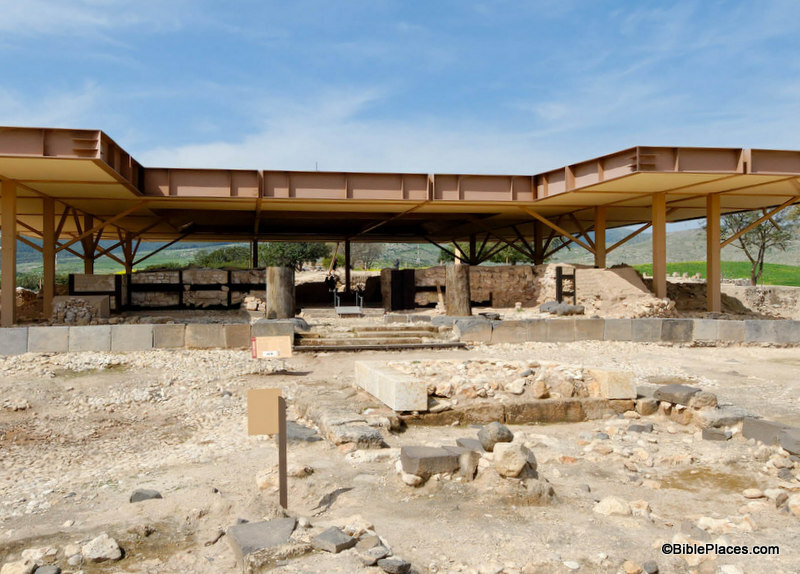 The Late Bronze Palace at Hazor is about 3,400 years old! Our picture of the week comes from Volume 1 of the Pictorial Library of Bible Lands and features one of the most impressive archaeological finds in Galilee. A large, modern, freestanding roof covers the remains of the Late Bronze monumental building which was most likely constructed by the Canaanites in the early 14th century B.C. The 1,300-square-meter roof was necessary to preserve the mud-brick walls that were found here preserved to a height of about 2 meters. This building has been interpreted as a ceremonial palace by one excavator and as a temple by another. Over the course of the current excavation project (which started in 1990) the whole building was excavated along with a large, paved courtyard in front of the building. The courtyard contains a large altar that was built with ashlars in its first phase, and at a later phase was crudely expanded to the east. (The altar can be seen in the foreground of the picture.) The building is approached by a broad staircase with four steps; at the top, two massive pillars stood on either side. Only the basalt bases of the pillars have survived, leading the excavators to suggest that the pillars were made of wood, like so many other features of the palace/temple. Large, wooden pillars have been reconstructed and stand on the bases today. The two pillars stood on the edge of a wide porch which was retained by a long row of basalt orthostats. After passing the pillars, a visitor then crossed the porch to enter the building through the main doorway. Similar to the porch, the walls of the building had a long row of basalt orthostats at their base, and the upper portions of the wall were made of mud-bricks inlaid with wooden beams to give greater stability (only the negative image of the wooden beams remains, but new beams have recently been placed in the walls as part of the restoration efforts). The walls are almost 15 feet thick. Once inside, the visitor was standing in a large room, 40 by 40 feet, that was lined with walls that had even more orthostats along their bases. Amazingly, the floor of this room seems to have been made up of wooden beams: the artifacts inside this room were found below the level of the orthostats in a level of ash. The ash was tested and found to be cedar of Lebanon. This is the first wooden floor that has been discovered in any excavation in Israel and it illustrates the luxurious nature of this building and, by extension, the wealth in the city of Hazor in the Late Bronze period. This large room is interpreted as the throne room by one of the excavators and it is surrounded on three sides by smaller rooms. The pattern of the building is similar to a palace that has been discovered at Alalakh, north of Ugarit. In the 13th century B.C., the building was destroyed in an intense fire, over 2350° Fahrenheit, that partially melted the mud-brick walls and even cracked the basalt orthostats. The intensity of the fire was due to the large amount of wood in the structure, the large quantities of olive oil that were being stored there, and probably the high winds that typically come at mid-day. This was explained to me during a tour of the site by Amnon Ben-Tor who directed the excavations for many years. Ben-Tor attributes the destruction to Joshua and the Israelites, but following an early date for the Exodus and the Conquest, I would propose that this destruction should be attributed to the Israelites during the time of Deborah and Barak (Judges 4). So if you would like to take a tour through an “old” building, come visit the historic, 19th-century home here in Kentucky. But if you want to redefine what you mean by “old” then I recommend you visit the Late Bronze palace at Hazor. This photograph and over 1,100 others are available in Volume 1 of the Pictorial Library of Bible Lands and is available here for $39 (with free shipping). 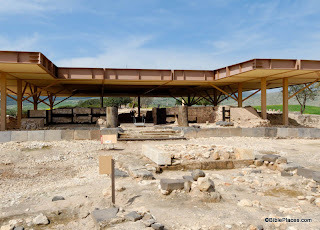 Further images and information about Hazor, including external links to other sites, are available on the BiblePlaces website here. Information about the ongoing excavation project at Hazor is available here. Information about visiting the site is available here.